Comparing microbial extracts with Dr. Sandra Loesgen. The Human Immunodeficiency Virus, or HIV, is the virus that leads to Acquired Immunodeficiency Syndrome (AIDS). Most of our listeners have likely heard about HIV/AIDS because it has been reported in the news since the 1980s, but our listeners might not be familiar with the virus’s biology and treatments that target the virus. However, HIV has adapted to allow mistakes to occur during the reverse transcription stage such that spontaneous mutations change the virus within the host individual, and the virus becomes tolerant to drug treatments over time. Due to the highly mutable nature of HIV, a constant supply of new drug treatments are necessary to fend off resistance and treat infection. Our guest this week on Inspiration Dissemination, Ross Overacker a PhD candidate in Organic Chemistry, is screening a library of natural and synthetic compounds for their antiviral activity and effectiveness at disrupting HIV. 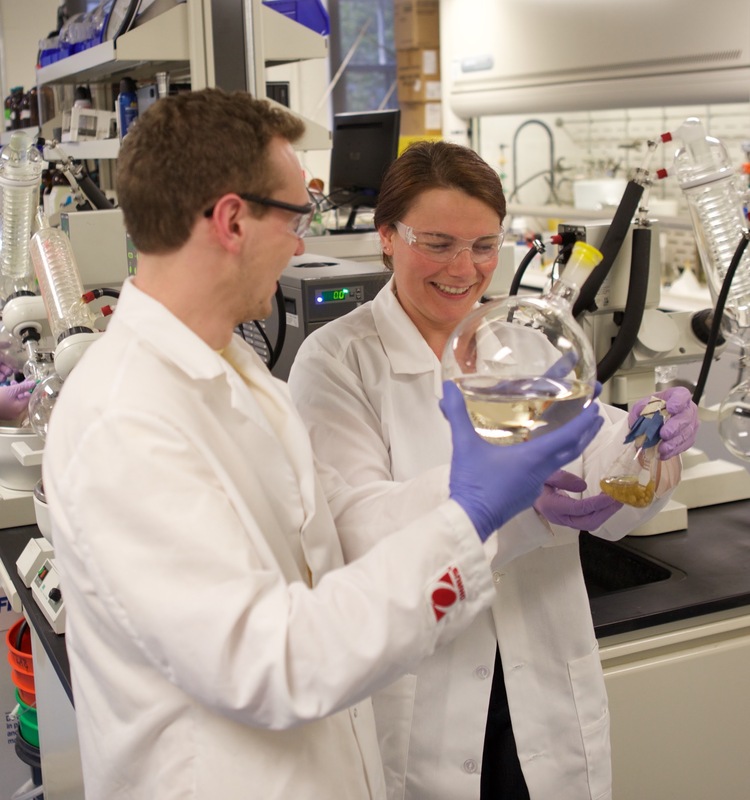 Ross works in a Natural Products Lab under the direction of Dr. Sandra Loesgen. There, Ross and his lab mates (some of whom were on the show recently  ) test libraries of compounds they have extracted from fungi and bacteria for a range of therapeutic applications. Ross is currently completing his analysis of a synthetic compound that shows promise for interrupting the HIV infection cycle. 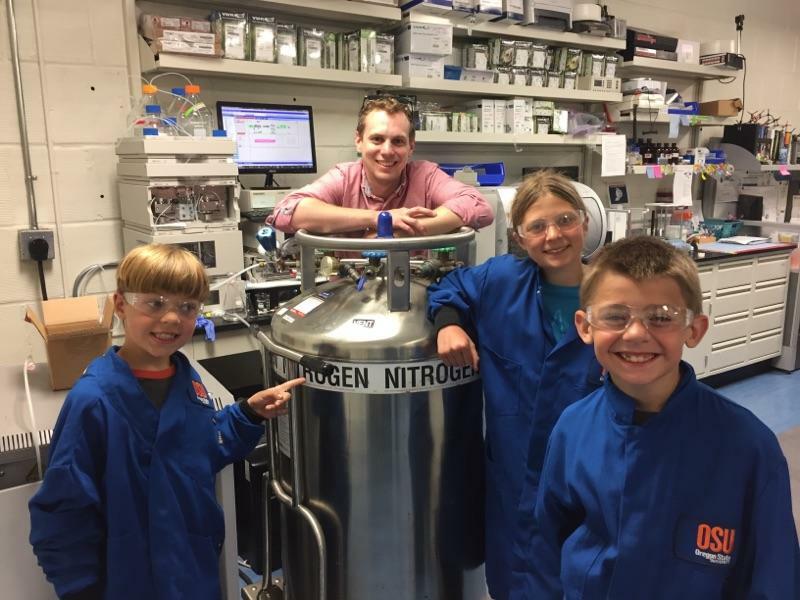 “Uncle Ross” giving a tour of the lab stopping to show off the liquid nitrogen. Working in Lab with liquid nitrogen. Collecting Winter Chanterelles in the Pacific Northwest. WSU’s chemistry club, eventually becoming the president, by showing off a “flaming snowball” and tossing it from hand to hand—don’t worry he will explain this on air. For Ross, chemistry is a complicated puzzle that once you work out, all of the pieces fall into place. After a few undergraduate research projects, Ross decided that he wanted to continue research by pursing a PhD in Organic Chemistry at Oregon State University. Tune in this Sunday October 7th at 7 PM to hear from Ross about his research and path to graduate school. Not a local listener? Stream the show live or catch this episode on our podcast. This entry was posted in Chemistry, College of Science, Organic Chemistry, STEM Outreach and tagged algae, Chemistry, compounds, drug, fungi, graduate school, HIV, infection, natural products, Organic Chemistry, outreach, research, RNA, synthetic compounds, treatment, undergraduate research, virus on 2018-10-07 by Kristen Finch.